If you ask folks who Helen Thomas was, most would simply shrug their shoulders and cast a blank stare. Helen Thomas had a larger impact on our world than most would understand. She was born in 1920 in Winchester, Kentucky. Her family moved to Detroit, Michigan when she was four years old where her father opened a grocery story. Her family came to America as immigrants from Lebanon, and neither of her parents spoke English upon landing at Ellis Island. Yes folks the story of Helen Thomas and her family is one of a true American-an immigrant family who contributed to our society. I'm sure that Helen will be missed by many. 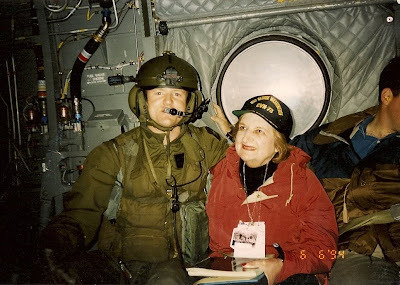 If you recall, I met Helen Thomas years ago while on a military mission. I'll refresh your memory with this picture of me taken beside her inside a helicopter. Keep in mind that, when this picture was taken, Helen was 74 years old and still the most alert and energetic passenger. Although, I must say, she was not too keen on the idea of skirting across the English Channel in a military transport helicopter. I believe that is why I was sitting beside her at the time. Even though I posted when Helen retired, I felt it worthy to post again now. Helen Thomas was a truly great American and will be missed. Not all press reporters are unscrupulous, and I'm sure Helen had her landmark stories. The Clinton administration provided many scandalous stories, however, without the press having to dig too deeply. Still, I see how much you enjoyed meeting Ms Thomas, and she probably had some wonderful stories to relate about her adventures. Would have taken her mind off the noisy, scary helicopter ride! Great photo Jim. I always wanted to fly in a helicopter, but never did. Came close when working at TAFB (Tyndall AFB) FL when I convinced the National Guard folks to let the MICAP supply people ride in one. Alas the military got to go up into the clouds, but not moi'.